ESAB Welding & Cutting Products Cutmaster® series of portable air plasma cutting systems, which range in output from 20 - 120 amps and produce a recommended ‘quality’ cut on material from 6 - 40 mm, are among the lightest and most compact in the industry, making them highly portable and easy to store. With ESAB Cutmaster products, the recommended cut capacity equals the system’s true cut capacity. A recommended cut has a smooth cut face with little or no dross and requires little or no rework or grinding, all of which improve productivity and quality. ESAB Cutmaster products provide additional output when needed, offering a maximum cut thickness that ranges from 60 - 150% greater than the recommended cut. As a result, they eliminate the concept of having to ‘buy up’, or purchase a machine larger than end-users actually need. Four products in the ESAB Cutmaster Series (the 60, 80, 100 and 120) share common features. These include a tubular ‘roll bar’ that protect the front and rear of the power supply for durability, as well as make the unit easier to carry. A trigger latch feature prevents hand fatigue during longer cuts, as it allows the operator to release the trigger while the system keeps cutting. Colour-coded LEDs on the front panel indicate pressure status and setup errors. The Auto Pilot Restart feature instantly reignites the pilot arc while cutting expanded metals such as grates and chain link fences. Each unit comes standard with the industry leading 1Torch (6.1 or 15.2 m cable options), but they also accept mechanised and automated torches. Primary power options are 50/60 Hz, 400V, 3-ph CE unit. The ESAB Cutmaster 60 features a 60 amp output, has a genuine cut of 20 mm and severance cut of 32 mm. It provides a 12 mm cut at 635 mm/min., which is 25% to more than 100% faster than competitive models and weighs just 19.5 kg. This unit can also be used for medium duty gouging applications when fitted with the correct torch consumables. The ESAB Cutmaster 80 features an 80 amp output, has a genuine cut of 25 mm and severance cut of 38 mm. It also weighs just 19.5 kg. The ESAB Cutmaster 100 features a 100 amp output, has a genuine cut of 35 mm and severance cut of 45 mm and weighs 28.1 kg. The ESAB Cutmaster 120 features a 120 amp output, has a genuine cut of 40 mm and severance cut of 55 mm and weighs 28.1 kg. 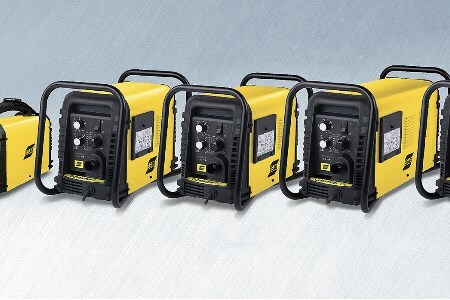 For primary power and location flexibility, the ESAB Cutmaster 40 enables users to switch from 1-phase, 208 – 230VAC primary power to 115VAC primary. This unit produces a genuine cut on 12 mm material, cuts a maximum thickness of 15 mm material and weighs only 11.8 kg.